Rose Matcha was one of my online purchases when I put in an online order a couple months ago. The nice thing about purchasing the tea online is that you get the fun coloured label on the bag – but it’s also difficult to read with the white print on the light green background. Rose Matcha comes in a sealed, resealable pouch. 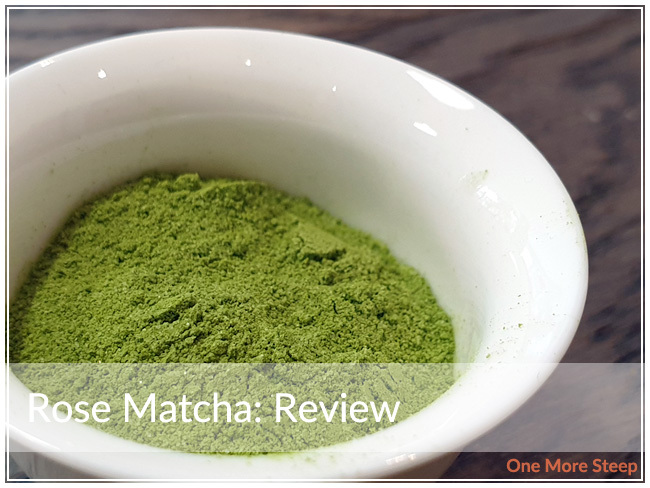 Rose Matcha is described as being a ‘drink mix’, which isn’t too surprising when you consider the fact that matcha is not the first ingredient listed for this tea. 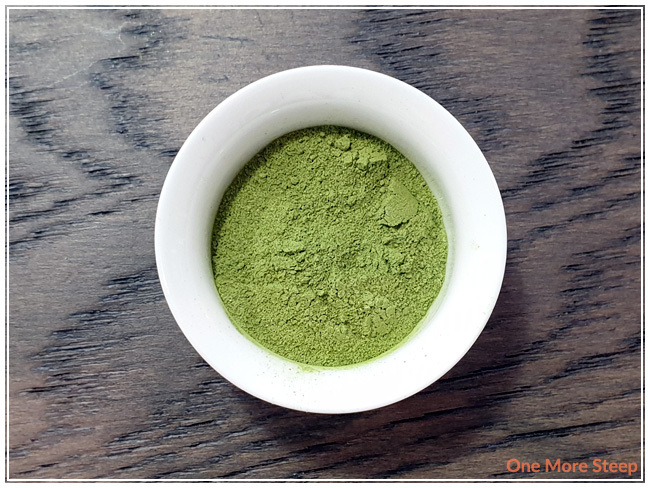 The matcha blend powder is a bright green, with vibrant grassy and rose notes. Rose Matcha consists of: cane sugar, matcha green tea, and natural rose water flavouring. DavidsTea recommends using 5 to 7 matcha spoonfuls of Rose Matcha per cup (16oz/475mL) and to use 85°C (185°F) water and to whisk it. I opted to use 2 matcha spoonfuls for my matcha bowl and I did use water that was 85°C (thanks to my handy variable temperature kettle). I sifted the powder into my bowl and then added the water and whisked it. 1 matcha spoon from DavidsTea is equivalent to ½ teaspoon. Rose Matcha whisks to a olive green colour. There’s a sweet, floral/rose aroma from the whisked matcha. It has a very floral flavour to it – which is great if you love the taste of roses. The matcha base provides light grassy notes in the background. I do find Rose Matcha to be on the sweet side, I would prefer it to have a bit less sugar. 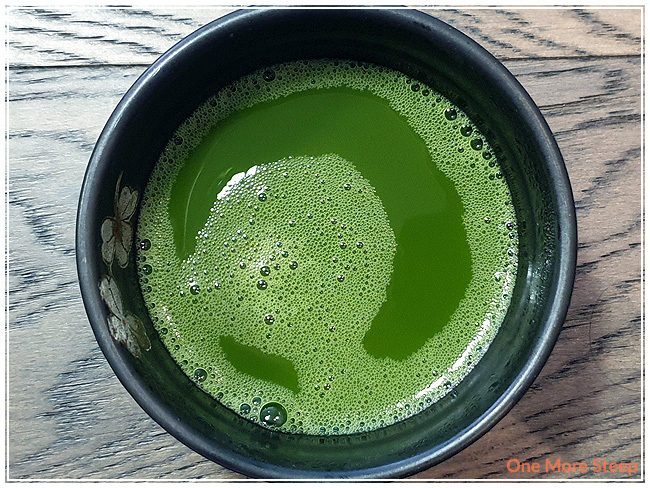 Rose Matcha is a great candidate for making into a matcha latte as the milk would help temper the sweetness. It isn’t as perfumey as I thought it might end up being, especially considering how floral the dry matcha powder was. Like with all matchas, Rose Matcha cannot be resteeped as all of it is drunk following the initial preparation. 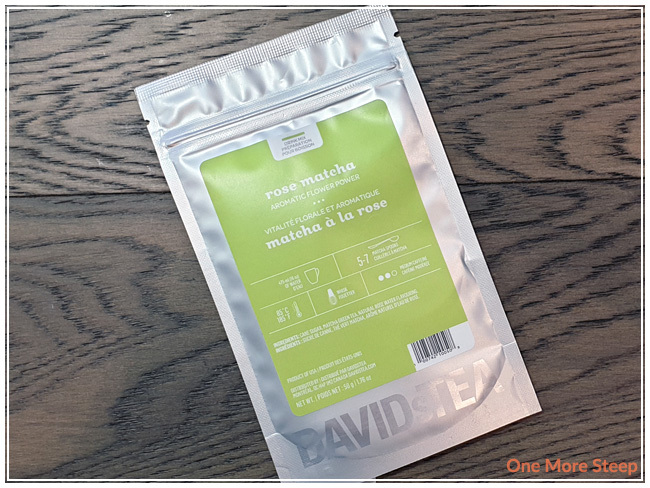 I liked DavidsTea’s Rose Matcha. I thought it had some great floral notes, and I did enjoy the fact that I could still taste the matcha base despite the cane sugar and rose water in this blend. I do wish that it had less sugar though, as I find it to be very sweet (and I have a huge sweet tooth!). I’ll definitely be having this one as a matcha latte in the future – and think it’d be great iced as well! 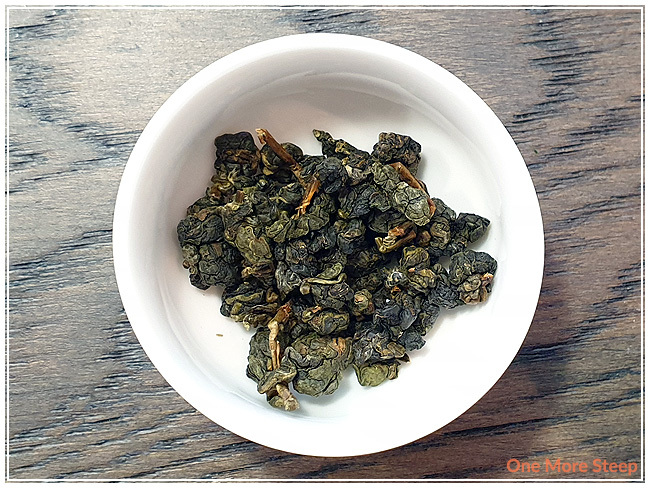 Oh oolong lovers, I have another oolong from Oollo Tea to share with you all. 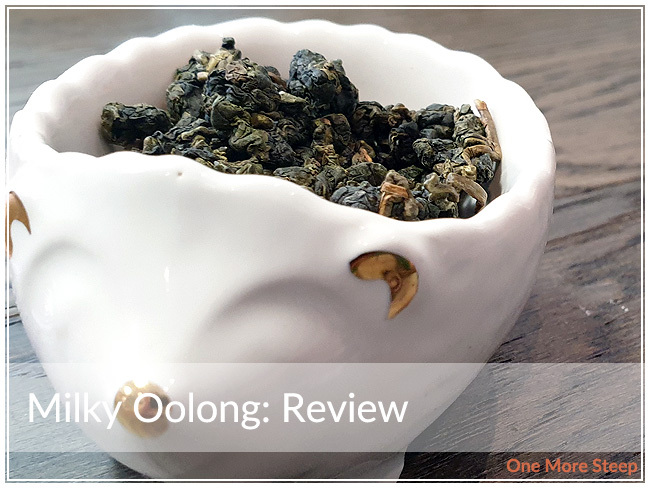 Unfortunately, I wasn’t able to pinpoint this product on their website – there is another milky oolong on their website, but I wasn’t able to determine if it was the same one (it has a different name…). Nevertheless, I’ll be sharing my thoughts on this Milky Oolong with you all. I purchased it as a part of a mystery bag at the 2018 Vancouver Tea Festival. This 15g sampler came in a sealed (not resealable) foil package inside of a patterned paper envelope. Because it was purchased as part of a mystery bag, I’m not able to determine how much this tea would cost per gram. The leaves are tightly bunched together, varying in colour from dark green to a bright green. There are a few sticks here and there mixed in. 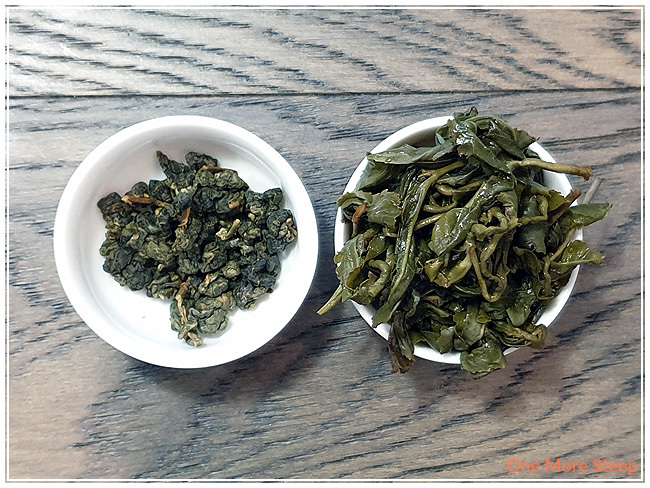 From the information that I do have about this tea, I know that Milky Oolong is direct trade, single origin oolong that comes from Chiayi, Taiwan. Oh, and the dry leaves have a light floral aroma. There were no steeping instructions with Milky Oolong, so I opted to steep it at 195°F (90°C) for an initial steep of 2 minutes. Milky Oolong steeps a light golden yellow. The aroma of the tea is sweet and floral. The flavour is a bit different though – while I still get that gentle sweetness that comes along with the floral flavouring, I also get a nice creamy and buttery flavour to it. It has a smooth mouthfeel to it – no astringency or bitterness noted with the initial steep. I can’t quite pinpoint what the floral flavour reminds me of – I’d say something close to lilacs might be possible. It’s very bright and mingles well with the buttery tones found in Milky Oolong. I resteeped Milky Oolong nine times (ten steeps total! ), adding an additional 30 seconds per subsequent steep. 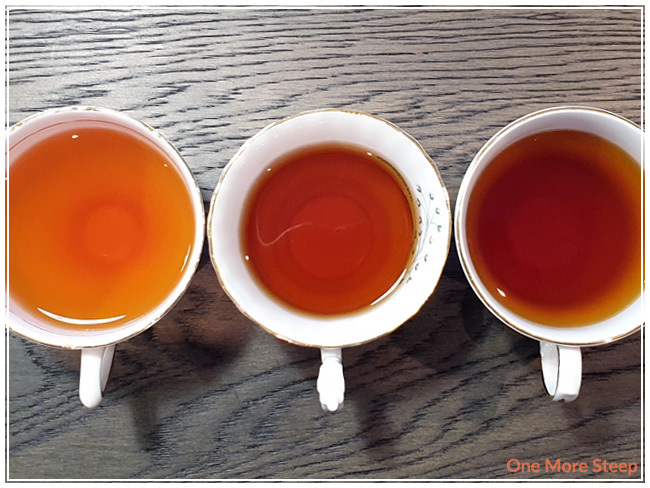 I found that the colour of the tea got darker for the first three resteeps, and then began to get lighter in colour. With each steep, the floral flavours began to be less noticeable while the buttery flavours got stronger. I found the milky/buttery flavours peaked at around the fifth or sixth resteep, and started to get weaker after that. My last steep with these leaves still had a great amount of flavour in the cup. 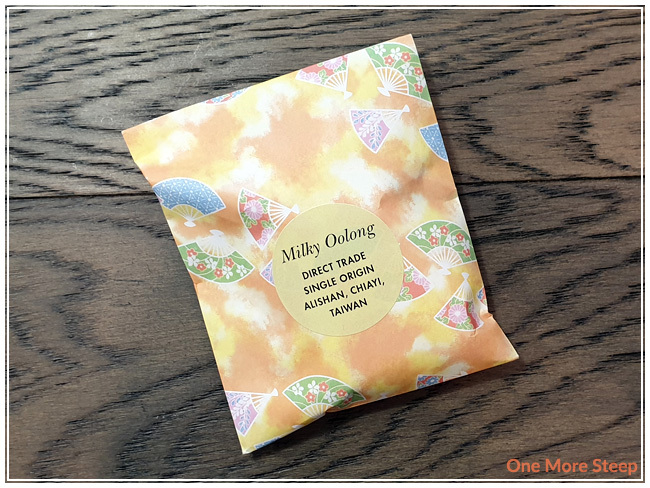 I loved Oollo Tea’s Milky Oolong. 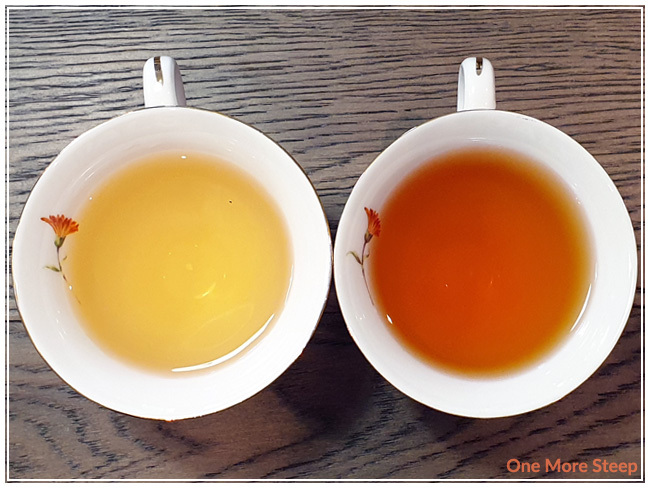 I loved how great this oolong resteeped (ten times!) . There’s a beautiful balance between the floral and buttery notes that stays well-balanced throughout each steep, which was a joy to taste. I think resteeped quite beautifully, and I do wish that there had been more information available about this tea. Considering it was a 15g sampler, I got 3 separate teapots worth of tea in that sampler (5g per session) and got 10 steeps in the first session alone – no matter how much the leaves end up costing, that’s still pretty good value! 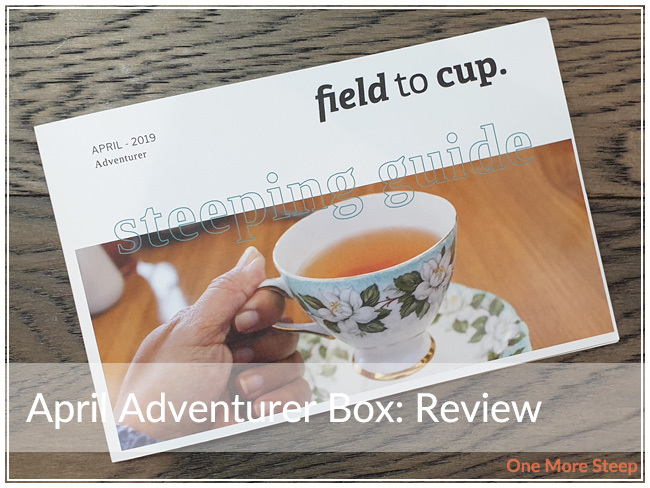 Field to Cup has provided me with the April Adventurer Box for the purposes of providing an honest review. It’s always a fun treat to open up the Adventurer Box from Field to Cup. As always, Field to Cup offers a variety of boxes (from traditional teas in the Adventurer option to seasonal blends in the Explorer option). The April Adventurer Box features five teas – four black teas and one white tea. 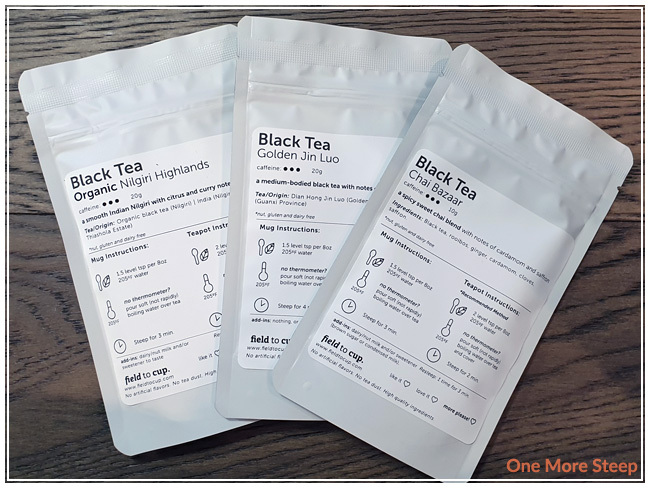 Each tea comes in a sealed (and resealable) foil pouch with a label that has information regarding tasting notes, steeping instructions, and ingredients. 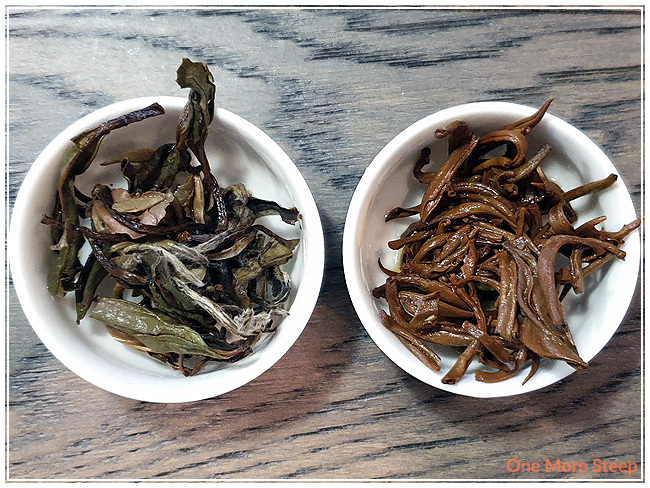 From left to right: Organic Nilgiri Highlands, Golden Jin Luo, and Chai Bazaar. The first three teas I tried were all black teas. Organic Nilgiri Highlands is a black tea from Indian. This straight tea from the Thiashola Estate in the Nilgiris District of India has a lot of dark reddish-brown leaf pieces. There’s a light citrus aroma from the leaves. The tasting notes provided by Field to Cup suggest curry notes, but I don’t really smell those in the dry leaf. Golden Jin Luo is a black tea from China, specifically the Guanxi Province. 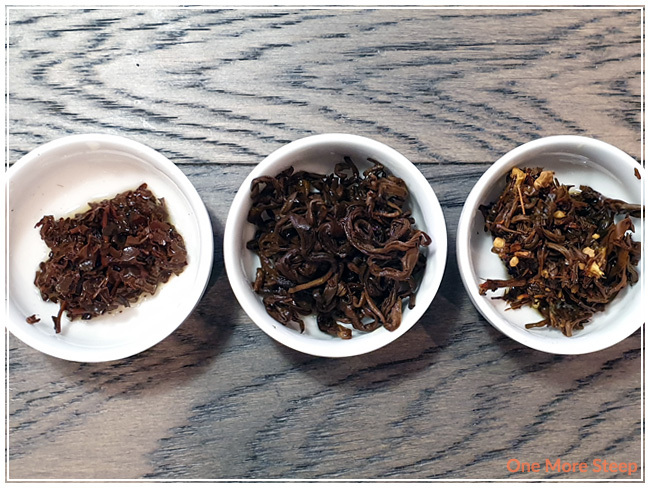 This tea has some beautiful leaves – the dry leaves are twisted into spirals, with plenty of light golden orange tips as well as some dark brown portions to the leaves. The aroma of the leaves reminds me a lot of yeast (for those that bake, you know what I’m talking about) and slightly malty, like an assam. Chai Bazaar has a gorgeous aroma. I instantly smelled the cardamom and ginger and it’s just so inviting. It smells a lot like other chais that I’ve had before, but there’s just something curious about it – most other chai blends I’ve had before have had cinnamon, which this blend lacks. Chai Bazaar consists of: black tea, rooibos, ginger, cardamom, cloves, and saffron. Luckily I don’t smell the rooibos in the blend. From left to right: Organic Water Sprite and Pure Gold. The second two teas that I tried were the Organic Water Sprite (white tea) and Pure Gold (black tea). Organic Water Sprite has a light floral aroma to it. Despite the bag being larger than the other tea pouches, it contained a similar weight of tea (20g) – making it a considerably more airy tea. This straight white tea is from the Fujian Province of China, it has some downy feathery leaves in it. Visually, it almost reminds me a of a blend of silver needle and white peony (which are both excellent types of white tea). Pure Gold has some lovely wiry, golden leaves that have some feathery features to it that remind me of a golden silver needle. There’s a sweet, fruity aroma to the dry leaf that reminds me a lot of lychee fruit. This black tea is from the Guangxi Province of China. Organic Nilgiri Highlands is recommended to steep in 205°F (96°C) water for 3 minutes. My initial steep was in 200°F (93°C) water for 3 minutes. Golden Jin Luo is recommended to steep in 205°F (96°C) water for 4 minutes. My initial steep was in 200°F (93°C) water for 4 minutes. Chai Bazaar is recommended to steep in 205°F (96°C) water for 3 minutes. My initial steep was in 200°F (93°C) water for 3 minutes. Organic Water Sprite is recommended to steep in 180°F (82°C) water for 2 minutes. My initial steep was in 175°F (79°C) water for 2 minutes. Chai Bazaar is recommended to steep in 195°F (90°C) water for 3 minutes. My initial steep was in 195°F (90°C) water for 3 minutes. Organic Nilgiri Highlands steeps to a light orange. There’s a noticeable citrus aroma that reminds me a lot of oranges. There is a light spicy note at the end of each sip, which I thought was really pleasant. I think that’s what Field to Cup is referencing in terms of the curry notes. Golden Jin Luo has a nice orange brown colour after it steeps. There is still a malty aroma to it. I found it tasted lovely though, there was a nice strength behind it – although it wasn’t as strong as an assam is, with a nice lingering taste to it. It feels like it would be a higher caffeinated tea, almost like a breakfast tea, but without the potential bitterness. Chai Bazaar has a dark brown colour to it. I found it has an inviting aroma to it – I found that I could taste the ginger, cardamom, and saffron. I found this chai blend to be both spicy and sweet – the cloves are a bit strong for me, I found. If you find the cloves to be a bit strong, adding a little bit of milk to it would help temper the flavour of the cloves (and perhaps you could have a chai latte). Organic Water Sprite steeps to a pale yellow colour. 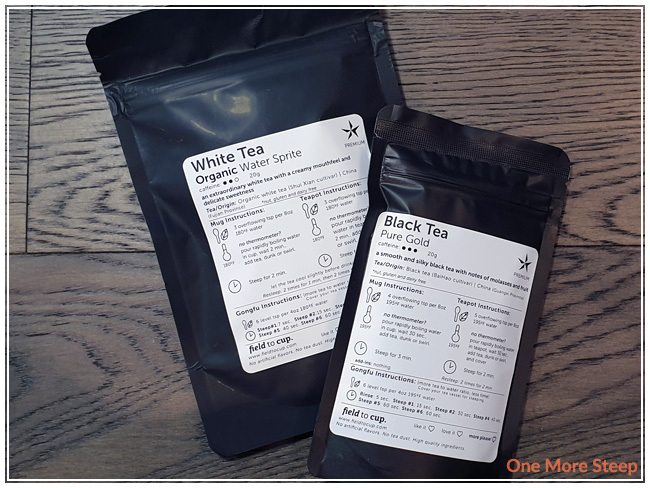 I found that it has a beautiful floral aroma – the flavour of the white tea is a pleasant sweetness with a smooth floral flavour that is present from start to finish. It has a light buttery quality to it that I found delightful as the sweetness lingers as an aftertaste. Pure Gold steeps to a golden orange colour. 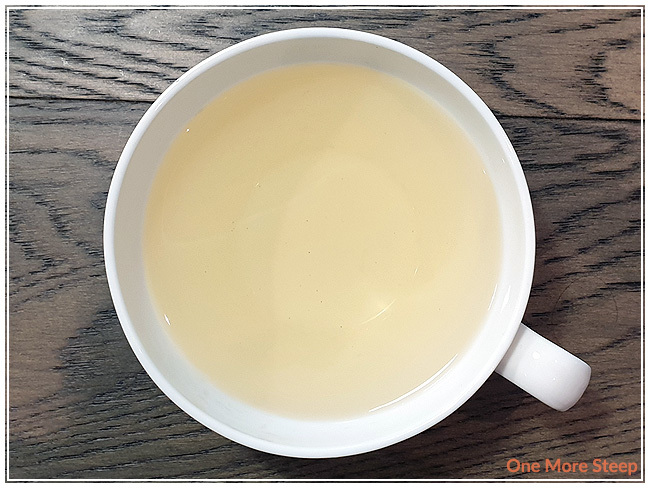 I found the tea to be sweet, and I would agree with Field to Cup’s tasting notes that it tastes like molasses and fruit, as I get a flavour that reminds me a lot of brown sugar as well as lychee fruit and apricots. It’s quite pleasant and I found it to have a very pleasant mouthfeel. As always with my resteeps, I add an additional 30 seconds for each subsequent resteep and keep the water temperature the same as the initial steep (I use a variable temperature water kettle – Breville’s IQ Kettle). 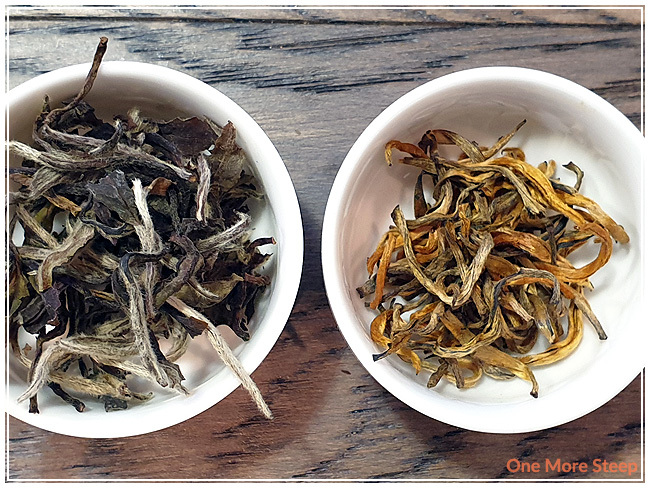 I resteeped both Organic Nilgiri Highlands and Golden Jin Luo three times, I found the flavour to be pleasant and quite similar to the initial steep for the first two resteeps. They were both considerably weaker by the third resteep, so I could recommend an additional two resteeps for those teas. Chai Bazaar did decently well for the first resteep, and poorly for the second so I would say that this chai blend is good for just one more steep. For Organic Water Sprite, I resteeped the same tea leaves a total of seven times. I found that the flavour stayed consistent and deepened for the first three resteeps, while it slowly lessened with each steep after that. It did a fantastic job with being resteeped. Pure Golden was good for resteeping as well, I managed to resteep a total of four times before I thought it was getting too weak in flavour to have again. I loved Field to Cup’s April Adventurer Box. I really enjoyed trying each of the teas and I found that they were all of good quality. 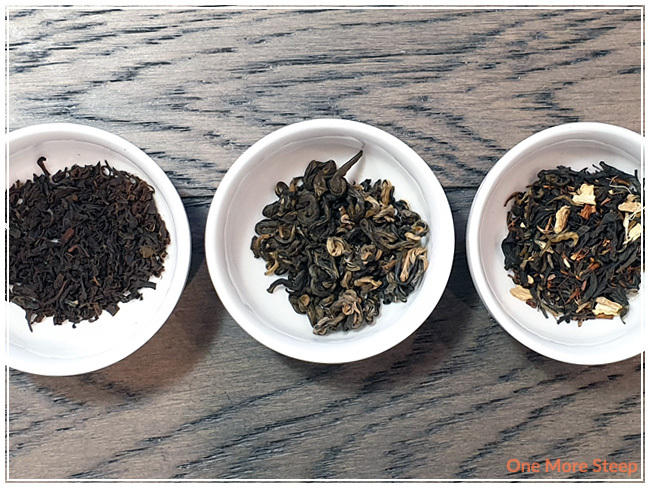 If you’re looking for some delicious black teas to try, this month’s box really fits the bill. Almost all of the teas can handle being resteeped more than once – which shows the quality of the leaves (and the box as a whole!). My favourites from this month’s box are Organic Water Sprite, Pure Gold, and Golden Jin Luo. If you ever decide that you just want to try one of the teas out of a box, you can purchase the teas à la carte from Field to Cup.